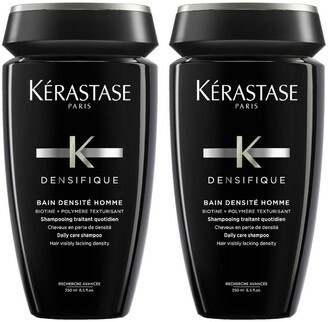 Cleanse and revitalise your hair with KÃ©rastase Densifique Bain Homme, a daily shampoo for men that addresses thinning hair that lacks density. Utilising Biotin and Texturising Polymers, the formula lifts away impurities whilst performing a thickening effect on the hair fibre; it effectively cleanses and refreshes the scalp whilst promoting denser looking hair over time. Hair feels clean, fresh and thicker.